Many people don’t even know that Guernsey exists, but the lucky ones who do know Guernsey, love it. Guernsey is an island; one of the Channel Islands, it is situated in the English Channel 50 km away from France’s Normandy Coast, but is a British Crown Dependency, self-governing and independent. It really is a little bit of heaven on Earth. The ancient name for Guernsey is Sarnia, “The Green Land”, and residents are still known as Sarnians today. Surrounded by wonderful sandy beaches and high green cliffs, Guernsey possesses some of the most, scenic, varied and interesting countryside you can see in Europe. The island is only 78 square kilometres in area but the variety of the landscape is amazing. Victor Hugo, known worldwide as author of Les Miserables, lived on the island in exile from France for fifteen years. He loved Guernsey and appropriately named it “a Swiss Canton” to celebrate the beauty of its countryside. The parish of St Martin, in the South-Eastern corner of the island, is one of the most beautiful places in this “Swiss canton”. St Martin is where you’ll find some of the most expensive properties in the island: to buy a four bedroom house here would cost you at least 1.5 million US$. Go to St Martin’s Church and have a look at the area around it; you will then understand why houses are so expensive there. Old cottages perfectly kept with large gardens literally bursting with blooming flowers surround the old church. In spring, benefiting from the mild temperatures, crane flowers, hortensias, poppies, roses and irises invade the gardens and make a wonderful contrast with the white walls of the cottages. 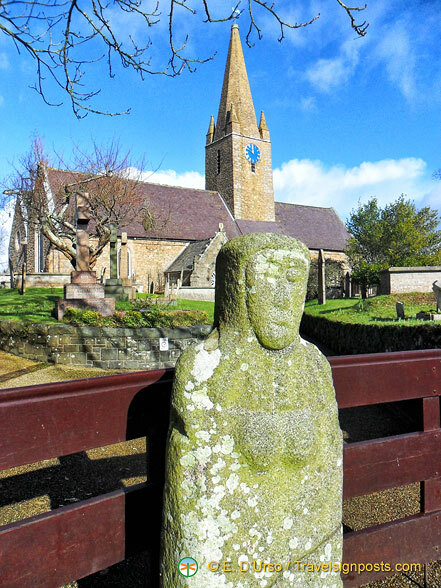 At the centre of this colourful circle, next to the entrance to St Martin’s church, stands a woman from 4000 years ago. Yes, it’s true! 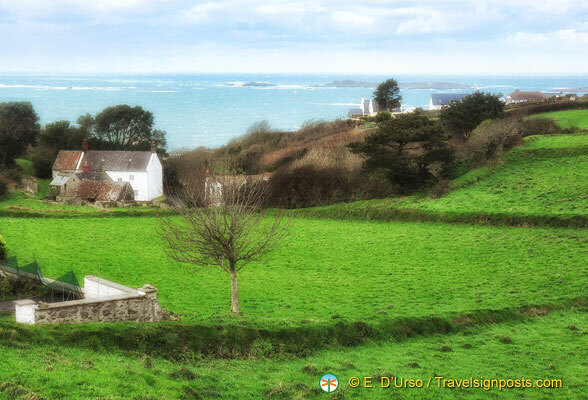 This is one of the many features that make the Guernsey countryside special. 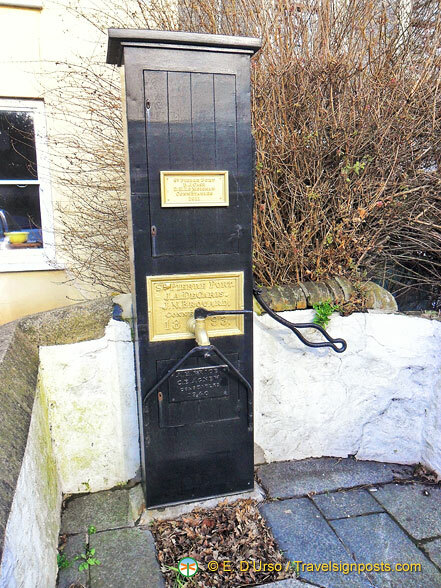 It’s not just cottages and gardens, in Guernsey there are many unexpected monuments dotting the landscape, making it unique. The woman from 4000 years ago is “La Grand mere du Chimquiere” in the local Norman dialect, which translates as “The Grandmother of the Cemetery”. It is considered the finest carved menhir in Europe. Neolithic settlers sculpted this goddess of fertility, a beautiful woman with an enigmatic smile, marking the place as sacred. Later on in the fifteen century the church of St Martin, the same one you can still admire today, was built but the tradition of the goddess of fertility remained. Newly married couples still place coins or flowers on the statue’s head and shoulders to bring them luck. From the church you can walk at leisure along the country lanes and enjoy gazing at the many fantastic cottages overlooking the sea and the sister islands of Herm and Sark. But follow me down to Saint’s Bay and you will see the best of all. The famous impressionist painter Pierre-Auguste Renoir stayed and painted in Guernsey. He particularly loved this corner of Guernsey for its colours and it is easy to understand why when you go down to the beach along the rues tranquilles. 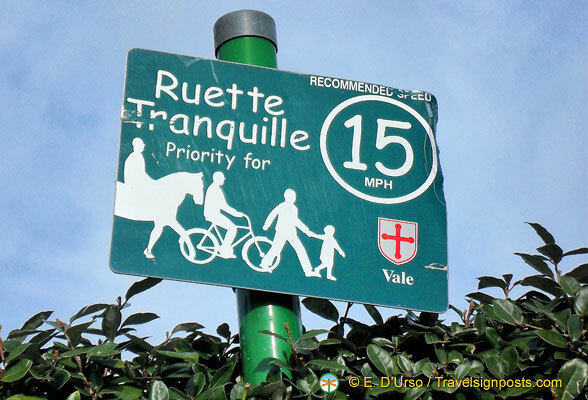 The rues tranquilles, literally “quiet streets”, but also called “green lanes“, are country lanes with limited traffic access that are spread throughout the countryside making it much more enjoyable to visit. If you walk through the green lanes to the Bella Luce Restaurant, you don’t just find a good restaurant. 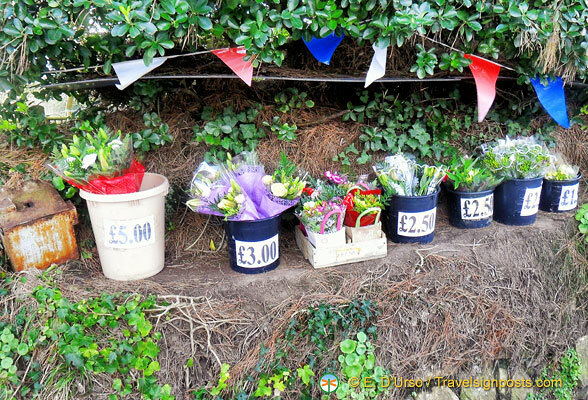 You will certainly notice another special feature of Guernsey landscape: the honesty boxes. Here agriculture is a big thing and everyone sells the products of his fields or even just of his garden in front of his own house. The famous Guernsey tomatoes and the celebrated Jersey potatoes (originally from Jersey, the other major Channel Island, an hour trip by ferry), but also chicken eggs, duck eggs, home-made jams and chutneys are displayed unattended in the gardens of many cottages. Every farmer has his honesty box in front of his house. You pick what you want, fresh and in season, and you leave the money in a little metal box. It is a fantastic way to do your shopping, believe me. Keep walking down to Saint’s Bay, where a wonderful sandy beach is waiting for you. But don’t rush and do concentrate on the lush vegetation. You will see buttercup flowers adding a splash of colour to the tall grass at the side of the road and many different species of butterflies flying around. Follow the stream running at the side of the road – because whatever little lane in the area you are walking along, it will have its own stream – and soon you will discover another unusual feature: an abreuvreur, a trough for animals. 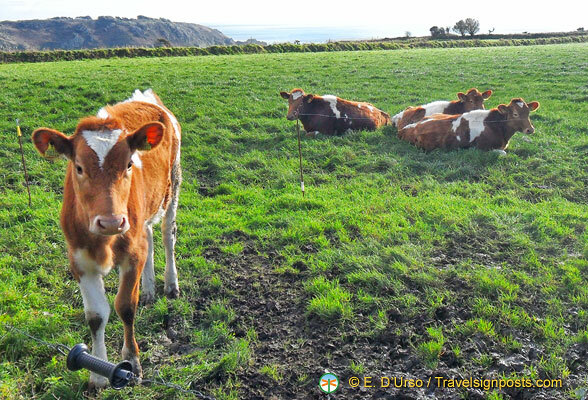 After all, you are in the kingdom of the Guernsey Cow, a breed of cattle used in dairy farming particularly renowned for the rich flavour of its milk. Try some of the local mature cheddar cheese from the Guernsey Dairy to understand what I mean. This docile fawn and white cow represents another important characteristic of this landscape, and a very friendly one too. But back to the trough for animals. There are more than forty in the island, each one with a different shape and perfectly kept. You will spot them along your walks in the countryside. They are a unique relic of Guernsey’s past. Finally, after walking through the lanes and hopefully after having had some rest and maybe a glass of the local apple cider (the Rocquette cider, a sweet cider locally made and very very tasty), you will arrive at Saint’s Bay. Saint’s Bay is a wonderful inlet where birds nest along the steep green cliffs. No wonder Renoir felt inspired by this place! When the tide is out, the beach is large and the golden sand is dotted with many seashells; you will easily spot crabs walking along. Crabs are another feature of the island. You can taste wonderful crab starters in many Guernsey restaurants or you can try out a crab sandwich at the popular cafe at the beach at Saint’s Bay next to the Martello tower. The famous Martello Tower, the round tower overlooking the beach, is one of the more characteristic landmarks of Guernsey. Throughout the island there are fifteen granite Martello Towers watching the sea. They were built during the XIX century to defend the shores of the British Empire. In this island, as with many other relics of the past, they remained untouched and preserved by time in perfect harmony with the landscape that surrounds them. There are many more walks you can do in the Guernsey’s countryside. You will always find something interesting and new. There is another corner of this little island you should not miss. It is the Little Chapel in the parish of St Andrew. 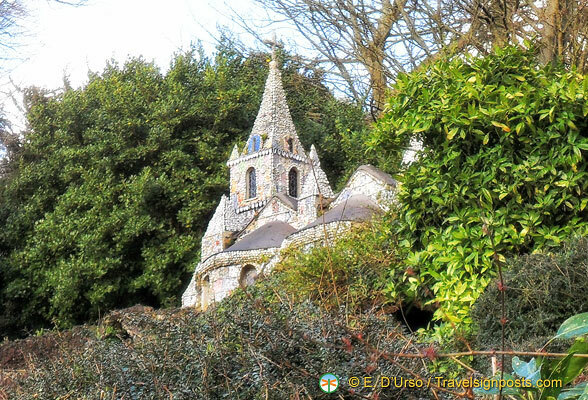 Not very far from picturesque St Peter Port, the main and only town of the island, on the road to the airport, you find a signpost pointing the way to the Little Chapel. If you follow the country lane, in the middle of a field where Guernsey cows are peacefully grazing there is a church that looks unreal. The church tower is scarcely taller than an average person, but you can still enter the church and visit it. From a distance, thanks to a clever trick of perspective, the church does not look as small as it is. In fact, it is a miniature of the shrine of Lourdes, made by a man of faith and imagination. 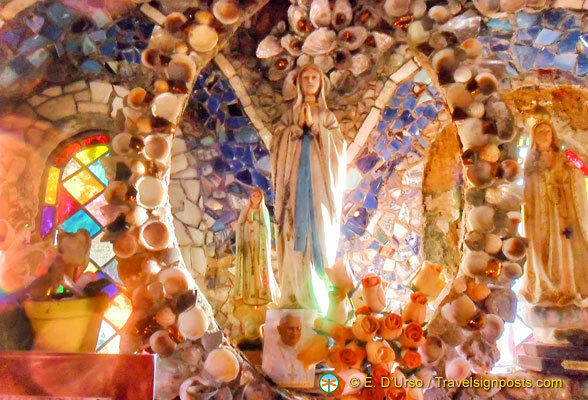 Brother Deodat built this church with only cement, seashells and fragments of china pottery. It is a work of art. With broken china he decorated not only the outside of this little church but the inside too. The inside is magnificent. A beautiful mosaic decorates the altar and the little apse. It is another secret marvel full of little, beautiful things waiting for you to discover. 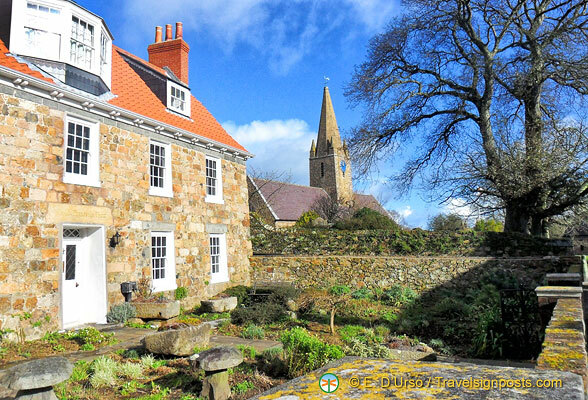 Visit Guernsey and discover this “wonderful garden” for yourself! 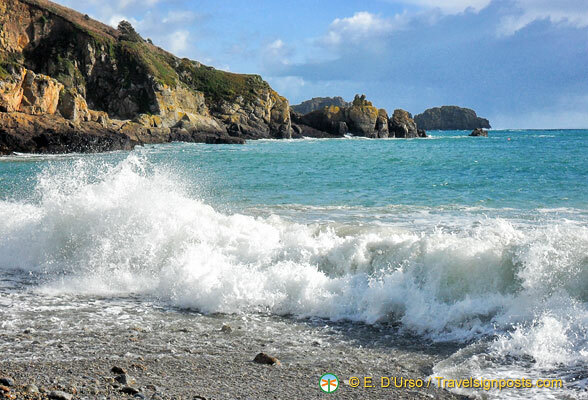 So how do you get to Guernsey to experience these wonderful attractions for yourself ? Guernsey has around eight flights a day from London and four from Southampton in England. 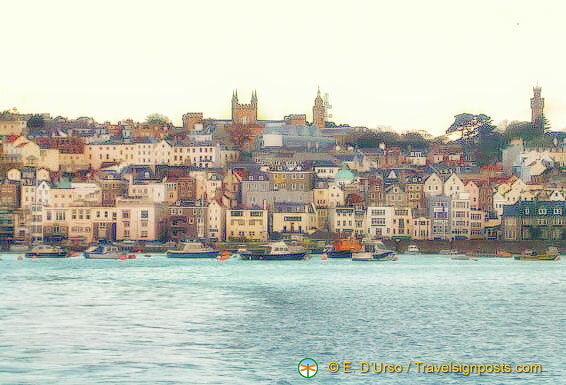 Ferries run daily from Weymouth and Poole in England, and from France there is a summer service from and to St Malo. You can visit the island just for a weekend, but I think you will want to stay longer after you discover this hidden pearl. You can walk along the coastal paths, visit the house of Victor Hugo, the medieval castle Cornet or just enjoy the sea and the wonderful restaurants of the island. It’s easy to find accommodation in St Peter Port, the main town, and from the St Peter Port bus station you can make use of a very efficient bus service running to every corner of Guernsey. From St Peter Port harbour you can also take a boat for a day trip to the little sandy beach of Herm or to Sark, the scenic island and “last feudal kingdom of Europe”. And you’ll be glad to hear that Guernsey is safe and a great place for walkers, and cyclists too.You will love Sarnia! I'm a traveler, I'm a rambler. I firmly believe that travelling is the best way to understand the true meaning of life. I completely agree with Pascal: all our miseries stemmed from a single cause: our inability to remain quietly in a room. I am one who really can't sit in the same place for long without getting restless and impatient. Read more about my ramblings on my travel blog What Am I Doing Here. 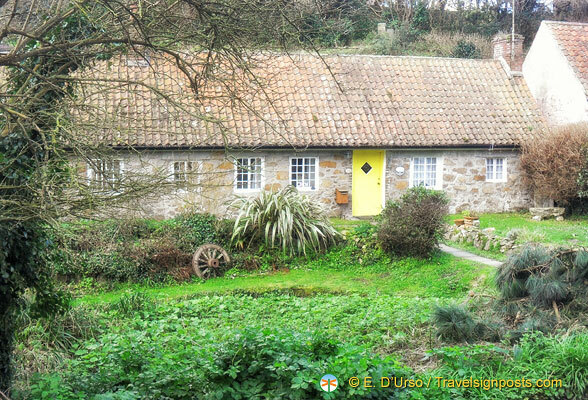 Hi Euginio, have you visited Sark, near Guernsey? I think the summer is the perfect season to visit Sark! Most people visit Sark in one day. They take a boat from Guernsey, at St Peter Port Harbour, at 10 am and they are back at 5 pm or 7 pm. You can stay longer if you like the experience, although in one day you will be able to explore the island entirely. Rent a bike on the island, it is the best way to visit it.